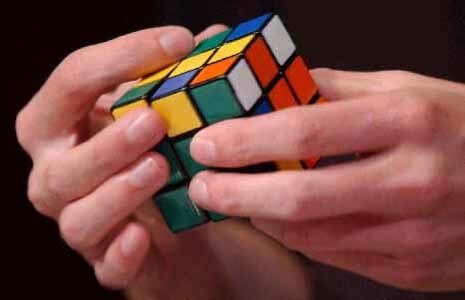 Rubik's Cube was the biggest and fastest-selling cult 'toy' of all time. It was invented by a Hungarian Professor called Erno Rubik. Over 300 million of them have been sold since the early 1980s. Here's how it works: The Rubik's Cube has six different coloured sides or "faces" each of which is made up of nine squares. Once the faces are jumbled up, solving the Cube consists of rearranging those squares by twisting the various faces around an ingenious central axis, until all six faces are back to their original colours. Sounds simple enough doesn't it? Well it's not - believe me you're talking to a man who sprained his wrist because he played it so much. There are, apparently 43,252,003,274,489,856,000 different combinations - which is why I was never able to complete it. That's my excuse and I'm sticking to it. Actually I did eventually manage to work it out but by that point no one was impressed (mind you that was two years ago). Now plenty of people can do the Cube, and some of them can do it fast. The UK's Champion Cuber, 19 year-old student Dan Harris, can do it in an average of just over 20 seconds. And he's recently notched up his personal best time of less than 14 seconds. Speedcubing is already big in America, and it's catching on fast in Europe too. This year (in early November), the World Rubik's Championships will be held at Disney World, Florida. So maybe you should put in a few more hours practice if you want to compete with the best. And if you can't do it, worry not. This pack also comes complete with a handy 7-step solutions guide to help you beat the Cube. 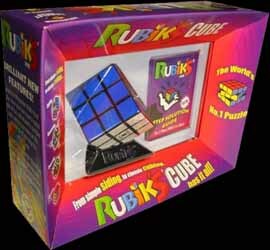 Whether your new to Rubik's crazy world, or remember owning one of these in its heyday, this is still a must own puzzle. Thanks Drumond Park for helping me revisit my childhood.